This is my very most favorite sort of project. The kind that comes to me in the morning and is finished by the afternoon. Extra credit? I didn't have to shell out a single penny. Sunday morning I was listening to John lead a practice and reading in a chair when it hit me. We have been wanting to fill the dead space behind our bed since we moved in, but haven't found anything we liked. I was thinking about this old sham we had sitting in our closet which matches our bedspread when all of the sudden I saw it cut up and ruffled on the wall. Love at first imagining. Let's just chat for a second before we get into the tutorial... as I said, I did this the same day I thought of it since I already had everything necessary. However, I think I want to improve on it. How much more awesome would it be with two white layers added (around the middle section- creating an every-other layer)? 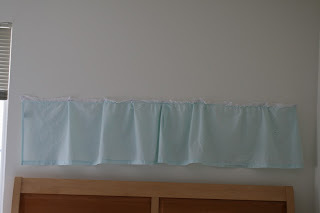 I wanted the ruffling to be tighter than it is, but I didn't have enough fabric. I'm going to add it. 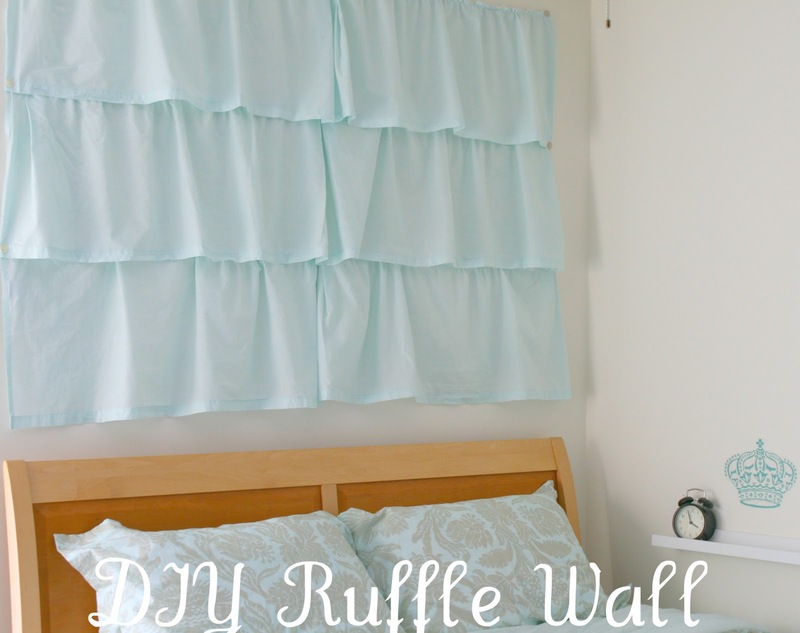 There is so much potential for adding ruffles to the wall. Wouldn't it be awesome stretched behind a couch?? Or ... stay with me... ruffling an entire DOOR! 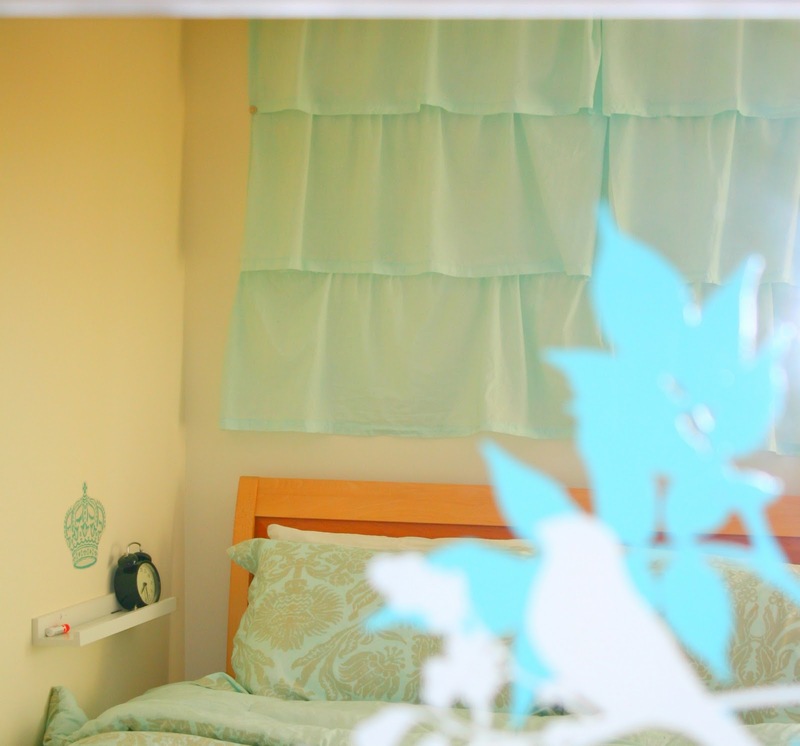 Maybe to a fantastic closet or a little girl's room. Ah. I love it. I'm already imagining several other places I want to do this, and best of all- I can! 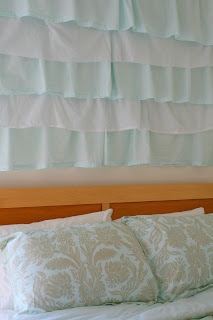 It's so inexpensive (all you need is a sham or an extra sheet) and so easy. 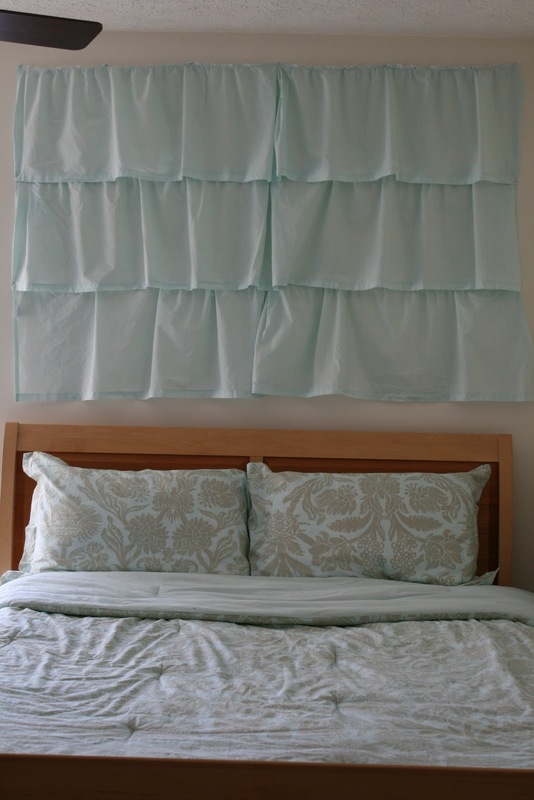 Plus, since I used a staple gun, if you don't like it you can just pull it down. ** No staple gun? You could always use pretty tacks to stick the fabric to the wall. (1) Cut it out. I used a sham and just cut the three sides off. 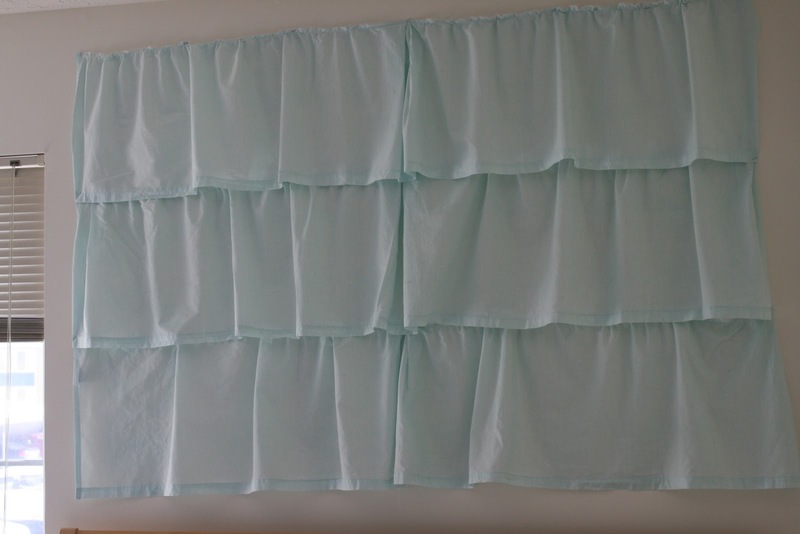 If you're using a sheet then you'll have to cut strips in the length (plus room for gathering) and depth you want. 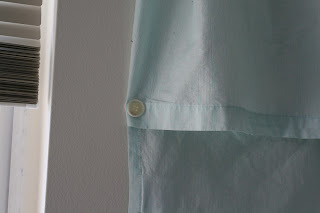 You can either hem the sheets or just leave the edge raw- or use Fray Check. 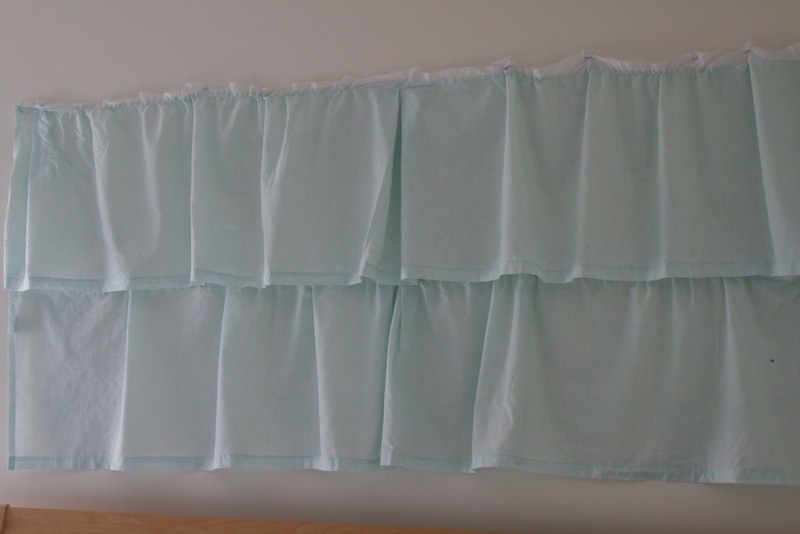 Using a sham was awesome because everything was already hemmed for me. (2) Gather it. 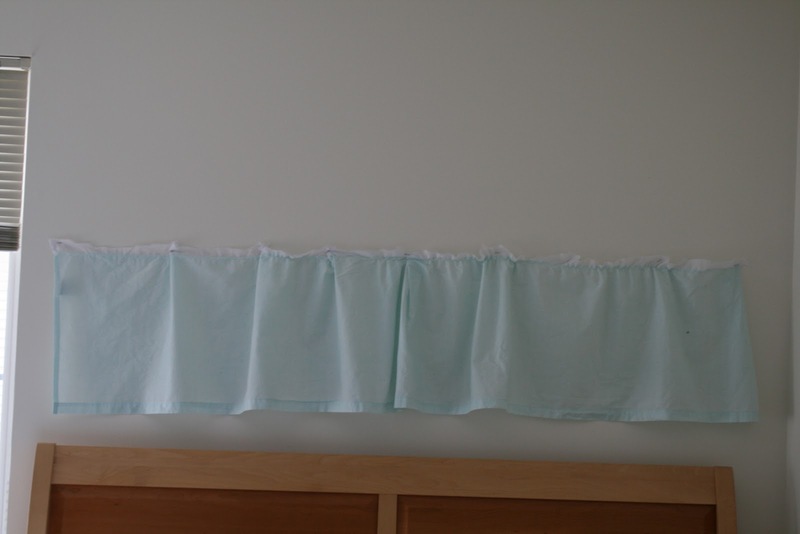 Gather your fabric to create ruffles. If you've never done this before, refer to YESTERDAY'S POST at the bottom. 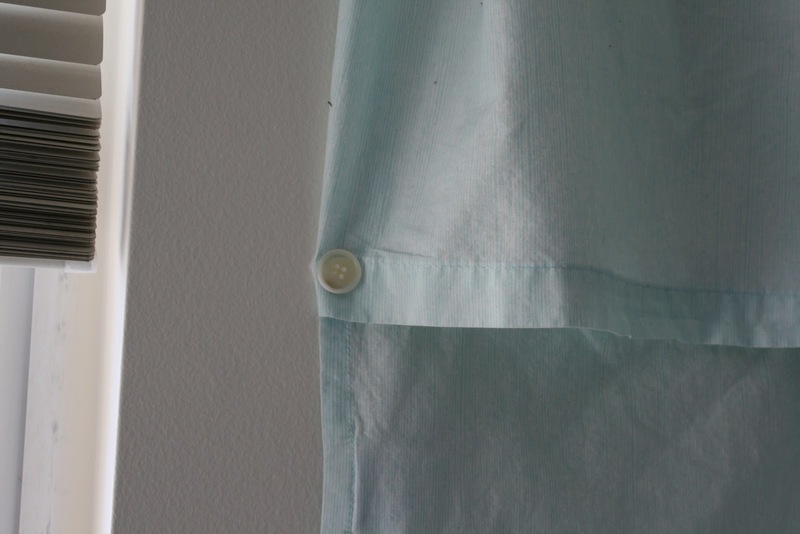 Or just listen in... You'll just use a sewing machine or hand sew a straight, loose stitch across the TOP of the fabric (not the middle, like yesterday's clutch). 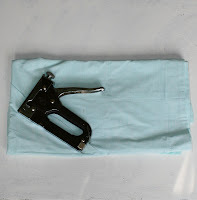 Next, take one piece of thread from ONE side and start to pull. 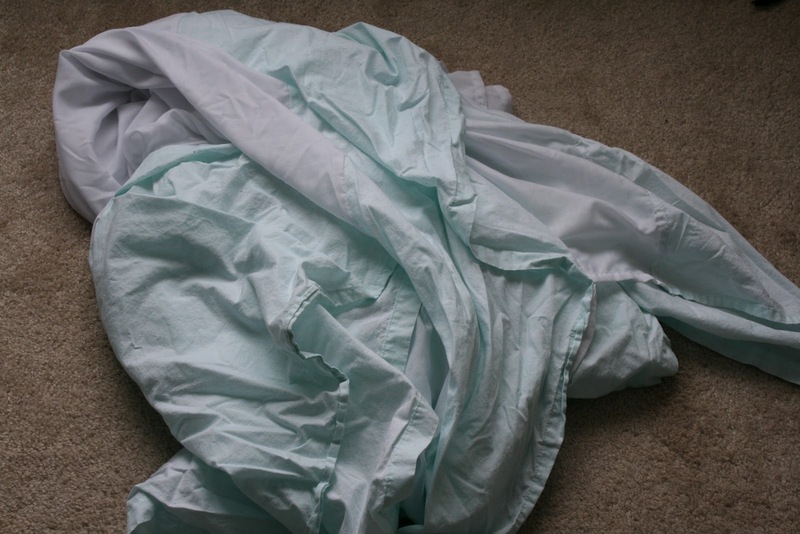 As the fabric begins to gather, move it down toward the other side of the material. When your material is the proper length/is gathered to your contentment, stop! (3) Attach it. 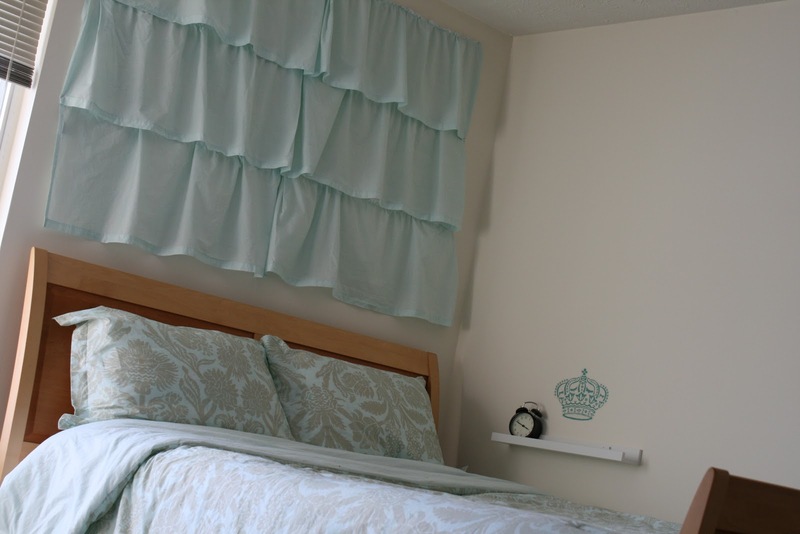 Using a staple gun, attach your first (bottom) layer to the wall. You'll want a partner for this so that you can ensure you hang it level. Add each layer on top being sure to cover up the top of the layer beneath it. You can make your layers as tight or loose as you'd like. 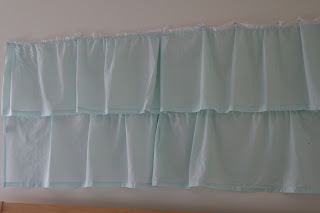 I wish mine were tighter, but as I said, I didn't have enough blue fabric. I really am going to add in two more layers in white! (4) Secure it (optional). I wanted to staple the bottom layers down at the sides to create clean lines all along the sides. SO, I did. Then I used a hot glue gun to attach buttons over the staples across the top layer and sides so that they couldn't be seen. I really hope you love this. Sometimes I get *so* excited about a project and then it doesn't go over very well with our audience. Other times I throw something together last minute and it's a HUGE success. I'm hoping that you'll catch my vision with this project and see how you can use it yourself. 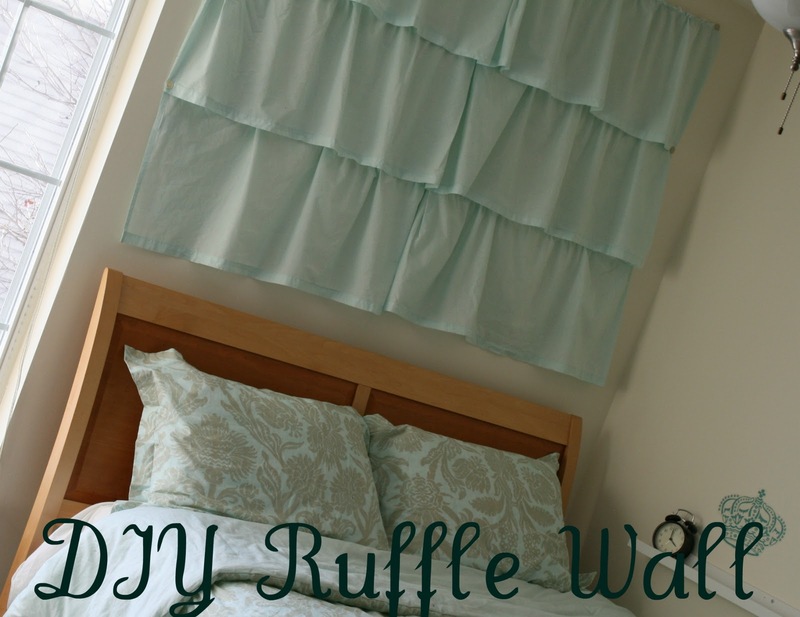 Even if it isn't something that's feasible in your places & spaces, I hope you can appreciate the fun of using ruffles as wall decor. Sure it's a bit different, but isn't different fun? 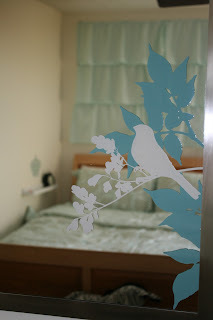 I'm sure I'll do several updates with all of the other walls or doors that ended up getting ruffled! If you didn't see the clutch from yesterday, you really should. I'm going to do another one in a black & white pattern this week. Very excited. 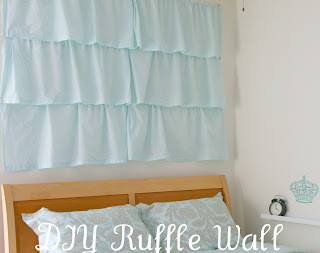 I'm deciding between two different ruffle projects for tomorrow, so stay tuned. I really like theme weeks. I should do more. PS- if you live in Michigan, have you SEEN the weather today? It's AMAZING! I can hardly believe it's January, and I'm ecstatic about that. I hope you're having a wonderful day and that life gets a little sweeter for you each day this week. As always, thanks for reading! ** Update one: I added in the white alternating layers. Unfortunately, I'm out of thread, so they haven't been gathered yet. This is just a temporary stage to show you the look of 5 close layers. I like it. I'll update again when it's done.